The History of the Goose! | The Goose Is Out! The History of the Goose! The Goose Is Out! began when Nyge and Sue got together – partly as a result of discovering a mutual interest in Martin Carthy at a party, who knows how – and were spending a lot of time travelling to folk clubs because there weren’t any locally in or near East Dulwich (London SE22 for those who don’t know!). In 2008 we put out feelers on The East Dulwich Forum to see if there was any interest in a folk club locally, and were pleasantly surprised by the positive response. As a result of that, we were approached by the then manager of the East Dulwich Tavern (EDT) pub on Goose Green, to see if we would put on folk nights upstairs there. We had an extremely steep learning curve – finding out about agents and who represented which artists, negotiating fees, producing and updating a website, setting ticket prices, finding out how to sell tickets online, printing flyers and finding good places to leave them, printing posters and putting them up, researching where to promote folk nights online and offline and promoting them there, and all the other things that our audience members probably never give a second thought to. As indeed nor did we until we suddenly found ourselves folk promoters! Our Very First Night …..
Swarb got stuck in a post-accident motorway traffic jam, and after several frantic phone calls to his agent we had to completely rejig the whole running order . Oh our relief when we saw Swarb with his fiddle under his arm appearing through the door around 9.30pm!!! And thank goodness it wasn’t a band needing a long sound check! We had more stress when we discovered that the person who had volunteered to do our sound for us that night had run up an eighty pound bar tab, including sandwiches for some of the support acts, all of which we had to pay for. And then demanded his fee on top. This culminated in a row outside the pub, which wasn’t exactly a great end to the evening. So then we had to find another sound person …. On another night, we discovered that the pub had been selling tickets for our concerts at too low a price, despite the prices being clearly marked in red for each concert. They then refused to give us the difference. This resulted in another row, this time with the manager, this time on the back stairs of the EDT. Sue (who had the row) was assured later by the person on the ticket table that nobody could hear it …. Their venture was a dismal failure, which we felt was some kind of justice …… the manager was also later sacked (nothing to do with us! 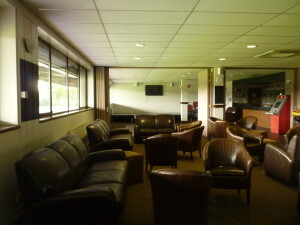 ), which we also felt was some kind of justice …..
Having spent the summer looking unsuccessfully for a suitable replacement venue, we were then lucky enough to be approached by somebody connected with the local football club, Dulwich Hamlet Football Club (DHFC), who not only offered us the use of their bar space which was twice the size of the EDT (meaning that we could put on more expensive artists, as we could sell more tickets to cover the fee) but gave us the use of all his PA equipment and offered to be our sound technician. Thanks, Davide! We ran concerts very successfully at DHFC for a while, and were so lucky to be able to have so many fantastic people there including Eliza Carthy (on the hottest day of the year ….the poor woman was pregnant and under really hot stage lights ….. and we had to send the audience outside at the interval to cool off) and Norma Waterson (Sue’s personal highlight, the Norma night was). There were many many highlights…. The lowlights were having to get to the venue in the early afternoon to put out chairs (the room held 220, not all seated though! ), dress the room with flowers, fairy lights and tea lights, and bring out and set up all the PA. Then, after the concert, having to clear up and pack everything away again. Sometimes we were there till 4am. Sometimes we had to go back on Saturday morning to finish clearing up. With hangovers. If you ever came to a concert at DHFC, you might be interested to see what the room looked like before the gig (and why we had to spend so long there setting everything up and taking it down again!) ….. so here’s a picture …. Another lowlight (literally) for quite a while was having – low lights. There was one memorable (for the wrong reasons) concert where the headliners were bathed in darkness on the stage unless they accidentally happened to step into the path of the beam from one of our lights-on-a-pole. We were exceptionally lucky to have the lovely Archie install proper stage lighting for us without charging for his time, and also lucky that Nick, the supportive owner of DHFC, agreed to pay for the lights themselves. Oh yeh, and we also had to carefully arrange the seats so that none of them were behind one of the pillars in what was a very long and narrow room ….. It was an interesting place, in retrospect, to be holding gigs. The bar manager used to go to Sainsbury’s to stock up on booze at the last minute, then wheel her Sainsbury’s trolley full of said booze past our punters to the bar …. and quite often the whole place reeked of bleach from the over-enthusiastic cleaner ….. Soon after we started at DHFC, we were approached by two bar managers who wanted Goose music (and audiences) at their pubs, so for a while we ran free entry nights at Hooper’s Bar and The Marlborough (a pub in Camberwell). However, we didn’t feel that having folk music in a space where some people just wanted to talk at the bar was really working, and we gave those nights up. We did have some memorable nights at Hoopers though, with people such as Wizz Jones and Bob Rafkin. Although we enjoyed (mostly!) organising and running the concerts at DHFC, we felt that actually what we had really wanted to do when we started out was to run an old school traditional folk club, with floorsingers and a raffle, so whilst continuing to put on the concerts, when we left Hoopers we started a regular folk club night Upstairs at the Mag in East Dulwich. We had no stage, no PA and usually no lighting, and the room was quite small but had very good acoustics, which was fantastic. We also had great support from Steve, the manager. We had many excellent nights at The Mag, and are proud to have hosted some brilliant headliners such as The Copper Family (we had a person come from Ireland specially to see them, and people were queuing into the street!) and also to have given many excellent local singers and musicians a space to sing and play in front of an audience, in some cases for the first time. We made a clear decision not to have “resident” singers and musicians, though we know this seems to work for some clubs. We wanted to be very inclusive, and for newcomers to feel welcome and part of the Goose, rather than feeling shut out from a clique. We have been told that we have a very wide age range in our audience compared to many clubs, and we feel that that is partly because of this policy. We do of course have some lovely floorsingers who come regularly. The difference is that they are not guaranteed a spot, and they take their turn in the queue along with everybody else! If they turn up late, then they might not get a song at all …. We were also very clear that we were not going to “vet” our floorsingers, even if this meant sometimes people having a spot who might have been refused one at other clubs. We feel strongly that everybody has to start somewhere, and we have seen some singers going from strength to strength who were very lacking in confidence and/or competence when they first started out. In fact over the years, this has been one of the most rewarding things about running the Goose. Even if someone doesn’t go from strength to strength, well, it’s only one spot in the evening, isn’t it – we feel that audiences at a club night should be able to cope with that! Being gluttons for punishment – well, gluttons for hard work maybe – after running our club nights for a while we felt that it would be nice to also have somewhere where people could just come and have an informal sing, with no headliner and no paying “audience”. So we started a monthly Singaround in the bar of another East Dulwich pub, the Crystal Palace Tavern (CPT). This went very well for a while. We started in a tiny side bar, and had to move to the other larger bar when we outgrew the space. Other people in the bar were interested, some joined in, and we even occasionally had people wandering in off the street to give us a song when they heard us singing inside. Unfortunately, the very supportive and folk-music-loving manager Adam left, and the inexperienced new manager was unable (and unwilling when asked) to deal with a group of obnoxious drunken people dissing our singers and trying to disrupt the Singaround. So we moved the Singaround to Upstairs at The Mag – which was good in a way because it was quiet, so the quieter or less confident singers could be heard, but also not good because it didn’t involve the wider community in the way that it had when we were singing in a public bar. The Ivy House Saga Begins – and Nearly Ends ….. In 2012 we were approached to put on some gigs at The Ivy House, a lovely cosy pub in Nunhead with a great musical history and a purpose-built stage – with proper curtains! But scarcely had we started with a few one-off nights there than the pubco suddenly gave the manager and staff a week’s notice that the pub was closing ….. the start of a saga with a very happy ending – see below! The Perils of Being a Folk Promoter ….. Anyway – phew!!!! – after a very steep learning curve, we had just got cosily settled into our three venues (DHFC, Mag and Ivy House) for our three regular nights plus the occasional one-off nights, when the rug was whipped from beneath our feet and for various reasons not to be told here (buy us a drink sometime and we’ll tell you all) we had to move all three of our regular nights!! Oh well. Change is good, no? Except that we had been extremely organised and had already booked artists for the Mag for the whole of the following year, AAARRRGGGHHHH!!!! So for weeks and weeks most of our spare time was spent tramping around East Dulwich and many nearby areas looking for suitable alternative venues. Sometimes we thought we had found one, only for things to fall through at the very last minute ….. In 2013 we moved both our club nights and our Singarounds to the wood-panelled upstairs room at The Old Nun’s Head in (yes!) 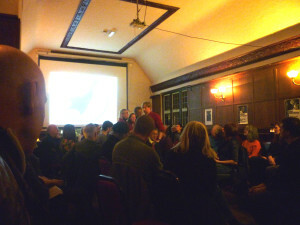 Nunhead, whichwas slightly smaller than the room at the Mag but had a nice cosy vibe. The Old Nun’s Head, that is, not Nunhead. Obviously. Dan and Lou the owners and Nick the manager were very supportive of the Goose. Thanks, guys! We were a bit worried that people wouldn’t make the trek from East Dulwich to Nunhead (it’s within walking distance, but not a short walk) but we were very touched when people did. Thanks you guys too! In 2013 we also moved our concerts from DHFC to Upstairs at The Crown and Greyhound (The Dog) in Dulwich Village. This was much more of an upheaval. The room was only half the size of the space at DHFC, so we could sell only half the number of tickets, which had a knock-on effect on our finances as artists had already been booked and we were contracted to pay at least a guaranteed minimum fee. We are very grateful to Jake the manager of The Dog for providing us with the space, albeit for several concerts we had to share it with a pop-up art gallery – including a massive bronze turkey on sale for £30,000 (sic), past which the people on the ticket table had to squeeze every time they went in or out ….. The Ivy House Saga Continues …. and Continues …. What happened next was that after a long and difficult period when it looked as if it might be turned into flats, The Ivy House was bought by the local community, and became London’s first community-owned pub. We let the committee know that the Goose would like to return there for its concerts, and luckily they agreed that this would be a good thing! Around the same time, The Crown and Greyhound finally got planning permission to turn its upstairs space into a “boutique hotel”, which had been on the cards for some time. So we couldn’t have continued there anyway. So all in all, all’s well that ends well – we hope! 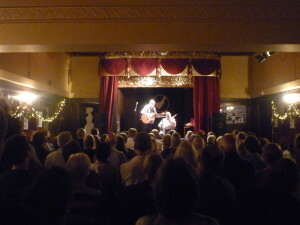 We were proud to be part of the re-opening of The Ivy House, and proud that our first concert there (Martin Carthy & Dave Swarbrick on 27 September 2013) sold out well in advance and was a huge success. We were told the news at very short notice, and it was rather a shock as we thought we were well settled at The Old Nun’s Head 🙁 A quick phone call to Harry at The Ivy House the same night found us a new home for our Singarounds – in The Ivy House refectory – phew! – the lovely panelled room next to the ballroom where we held our concerts. But at the time, we didn’t think there was a suitable room at The Ivy House for our club nights, as the refectory was too small and we thought the ballroom was too big. So after yet another long search trekking round possible venues, we moved to the back room of The White Horse in Peckham. In many ways this was ideal – it was relatively centrally situated near Peckham Rye Station, there was a bus stop outside, it was a nice cosy room with a nice vibe, and the manager and staff were supportive. Plus it had a good range of ales and decent food. The down side was very loud noise from an adjacent bar (even through shutters) which meant we had to use PA (we had always previously tried to hold our club nights unplugged ) and the fact that we couldn’t hold the night on Fridays because the pub had a DJ on Fridays. So we had to move to Thursdays, which was not great for us. Nevertheless, we had some good nights there. Out of the blue, shortly after moving to The White Horse, we were approached by Nick, the manager of The Old Nun’s Head, to ask us to go back there 😀 as the pubco had decided not to turn the upstairs room into a Craft Beer Bar after all. … Long story short, we were very tempted by this, until we were then approached by Nick again to say that the pubco had now said that maybe they might turn the upstairs room into a Craft Beer Bar at some point, but they couldn’t say when, and not only that, they couldn’t say whether they might sell the pub, and if so when that might be, either (grammar). So as we do like to arrange our nights reasonably far in advance, and at least to be able to book artists and print flyers for the whole year rather than flying by the seat of our pants, plus it is very annoying having to keep changing the website and details on listing sites (!) we decided we could not take the risk of going back to the Nun. We had mutually agreed with the White Horse that we would all reassess the situation at the end of the year (2016). In the meantime, we had held one or two concerts at The Ivy House which had been relatively less well attended than others, and as a result we had laid out the ballroom so that people were seated round tables rather than in rows of chairs. This made us think that actually the ballroom was suitable for our club nights after all. Combined with the fact that The White Horse had double booked us twice in a very short space of time (in one case we had to cancel the club night, and in the other case the other people had to cancel their night) we decided to ask The Ivy House if we could have our club nights there. We made this decision only after a lot of weighing up pros and cons and consulting some of our regular Goose people. So as from January 2017 all our regular Goose events – concerts, club nights and singarounds – are held at The Ivy House. We have also held a few one-off events at The Ivy House, such as shanty and sea song evenings and a concert by Mike Cooper. After we had held a few singarounds in the refectory, we realised that this wasn’t really an ideal place to have them. 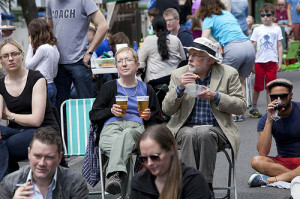 Also, in the Summer, we had people trooping through the refectory from the garden to get to the bar. In one case, somebody literally (and yes, I do mean literally!) fell through the closed garden door into the singaround (during, if memory serves, a rather quiet song) and then got up and lurched to the bar. Then lurched back. With drink. So with some trepidation as to whether it would work, we decided to try them in the ballroom. We also thought that this would still enable interested people who had just come into the pub for a drink to stand and get a taste of the singaround at the back without having to immediately pay to come in. A little while later we decided to soften the blow of having to pay a couple of quid by giving everybody a raffle ticket when they paid, for a raffle during the break. Which had the added bonus of helping us reduce the piles of demo CDs used as consolation prizes at our club night raffles. But I digress (again). Anyway. We were amazed and delighted when suddenly loads of people started coming who had never been to the Singarounds before. At our February 2017 night, we had to keep moving the ticket table further and further back into the room. With over fifty people there (singers and listeners) we reckon it was probably the most people we had ever had at a singaround up to that point. We had to seat many of them in rows at the back, which is definitely not what we like to do when we are trying to keep the evening friendly and informal. So, from March 2017, we started using the whole of the ballroom and having the ticket table at the door to the front bar, which is where it is on our concert and club nights. So far this seems to have worked. We could never have predicted when we first started the Singaround in the tiny side bar of the CPT that it would end up in the whole of The Ivy House ballroom! 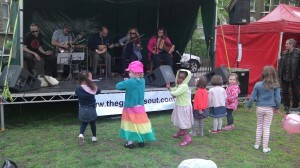 As well as all the above, for seven years we ran a stage at Goose Green Festival Fair (part of the annual Dulwich Festival in May), where we put on many of our talented local singers and musicians (not purely folk). The date always clashed with the May Singaround, so after getting up at crack of dawn to check that the stage and PA people had arrived on time at Goose Green, we had to run the Singaround in the evening. On one occasion, after the fair, we had a late lunch and then went back to Sue’s for a short nap. On rocking up at the Mag for the Singaround, we were somewhat surprised to walk in and find a full room and singing that had started without us. We had somehow lost an hour and thought it was 7pm when it was actually 8pm. OOOPS! For reasons also only to be told if you buy us a pint (! ), after much thought we decided after the 2018 festival that we sadly no longer wanted to be involved with it, however it was (mostly) fun while it lasted. 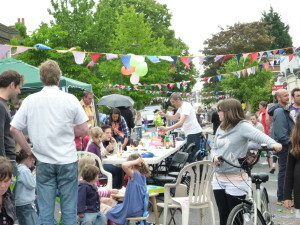 For several years, we also provided the music at the annual Crystal Palace Road/Ulverscroft Road Street Parties (apart from the Jubilee year when we and most of the organisers decided we didn’t want to celebrate the Jubilee, so were conveniently out of London on the relevant date …..). 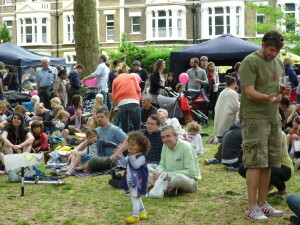 The weather of the parties varied from scorching sunshine to torrential rain …. We rather liked this ….. from one of the years when our “stage” was somebody’s rather small front garden …. 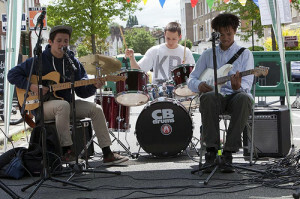 We were very pleased in 2013 to have a set from Cosmo, Ben and Louis, three very talented local schoolboys …. 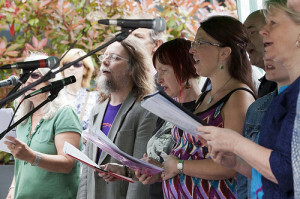 And here is The Dulwich Folk Choir singing at the street party (spot The Goose!) …. We have also run a benefit gig at DHFC to help set up a local community garden in the grounds of Dulwich Hospital, and a benefit gig for refugees in Calais, at The Ivy House. 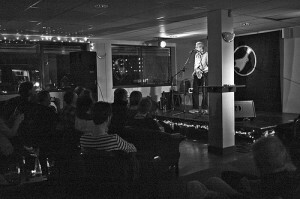 Want To Run a Folk Club? In case you’re wondering – no, we had very little prior experience of all this! 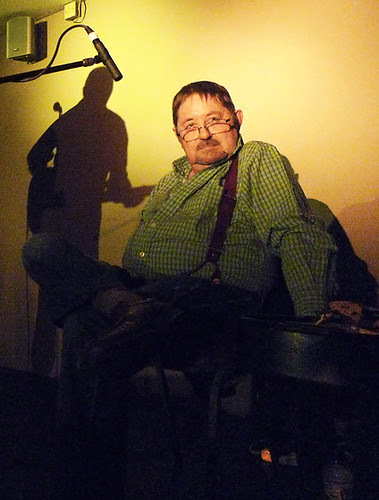 Nyge had run a few gigs in New Cross once, and Sue was on the folk club committee at uni – in Scotland in the sixties! Where mainly all she did was draw posters in those weird sixties designs and put them around the union, and perch on a shelf during the evening, hopping down occasionally to take people’s money. Ticket money, that is. And no, we get no outside funding at all! Would we recommend you to do it? Well, if you’re as passionate about the music as we are, you probably don’t need us to tell you whether to do it or not – but we’re happy to talk to you about what’s involved! We’d hate to see a clone of the Goose happening though – we think one of the greatest things about the folk scene is that each club and event is different and everybody is doing their own thing. 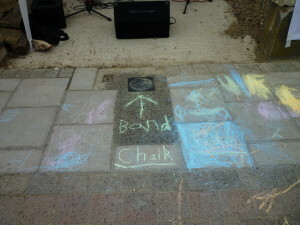 And – we think the folk scene is positively thriving! It’s certainly changing from the fusty old club days, but there are so many different things going on now, and so many young people getting into it, we are certainly not amongst the doom-mongers who – er – monger doom. How did the Goose get its name? A koan is a riddle which cannot be solved by the mind. A tiny newly-hatched gosling is put into a large glass bottle whose narrow neck is just large enough for it to enter. It lives in the bottle until it is a fully grown goose. The riddle is: How can the goose be released from the bottle, without either breaking the bottle or killing the goose? The answer is: The Goose Is Out! 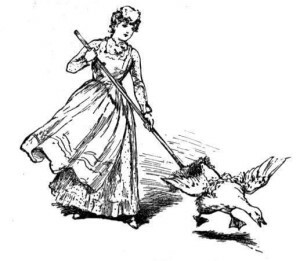 Please do not ask us to explain this, as we won’t 🙂 It cannot be solved by the mind, as we said …..
Oh – and conveniently, Sue already had the domain name registered, and our original venues were just up the road from Goose Green ….. plus we found some nice Goose-related pix on a copyright-free clipart site …..